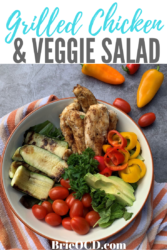 This grilled chicken & veggie salad is hearty, healthy and full of color. It is the delicious combo of grilled chicken tenders and various veggies that will never make you bored. I divided all the ingredients in this recipe into 6 portions. Per serving (without dressing) this salad has 372 calories 12g fat, 21g of carbs and 31g of protein. With dressing it has, 496 calories, 24g fat, 22g of carbs and 31g of protein. I used about a tbsp of dressing on my salad because you don’t need much with all the fresh flavors in this salad. I am not a big mint girl but the mint really pops and makes this such a fresh dish. That combined with all the veggies makes this a home run. 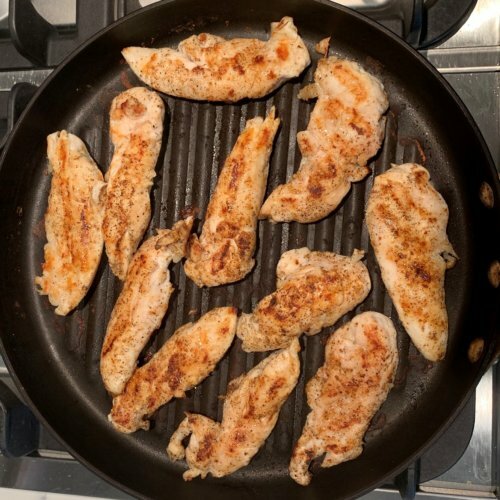 This recipe is naturally gluten-free and to make it vegetarian you simply leave out the chicken. I would suggest adding some quinoa or beans to get your dose of protein. It is a little high in carbs to be keto friendly (I believe). Since it has 21g of carbs I think that is on the higher side if you are on this diet. However for me, all the carbs come from vegetables so I find it hard to believe that this is “bad” for you. I say everything in moderation and you are golden! This salad takes about 30 minutes to prep. 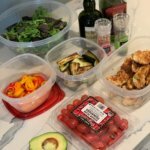 But once you have everything prepped and put into containers it will take you less than 5 minutes to prepare every morning or night before bed. Remember preparation is the key to success and meal prepping before your hectic week will ensure that you don’t make bad decisions down the road! 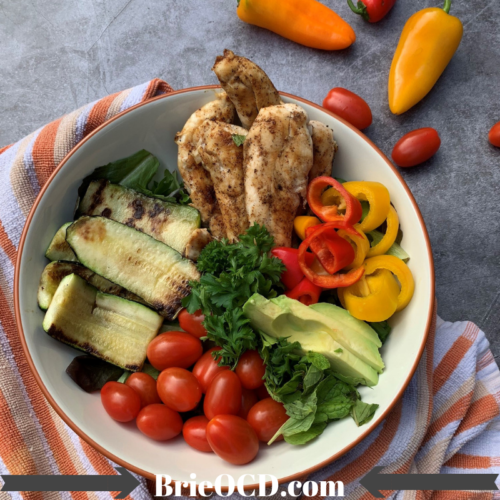 I used balsamic vinegar and olive oil for this salad because you honestly don’t need much to make all the flavors pop and get a little moisture. 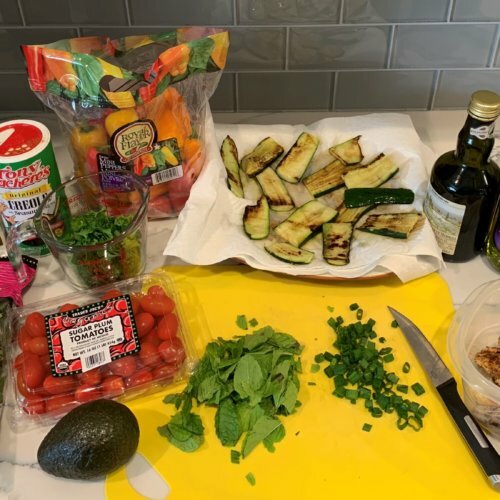 Since you grill the zucchini in olive oil and the tomatoes are also juicy, a little dressing will go a long way (tell that to my husband will ya?!) You can try my simple dressing below OR feel free to use your dressing of choice. Just make sure it is not high in carbs or sugar. Salad dressings are sneaky and can add a whole lot of fat, calories and carbs when you’re not looking! 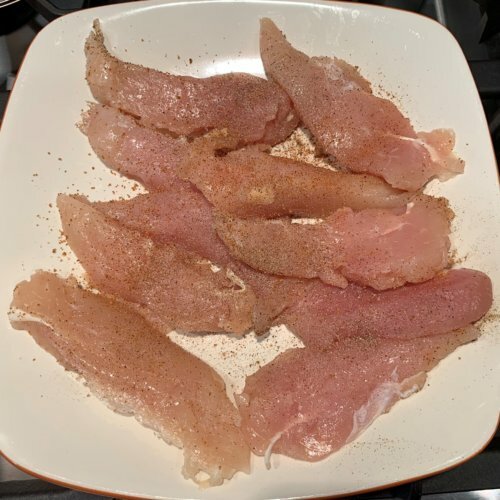 lightly season each side of chicken tenders with salt, pepper and creole. 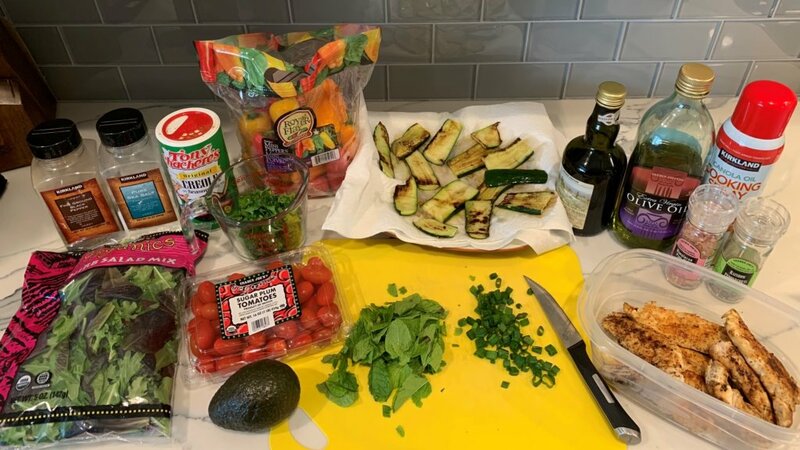 while chicken is cooking, chop mint, parsley and slice green onion, bell peppers, cucumber and zucchini. 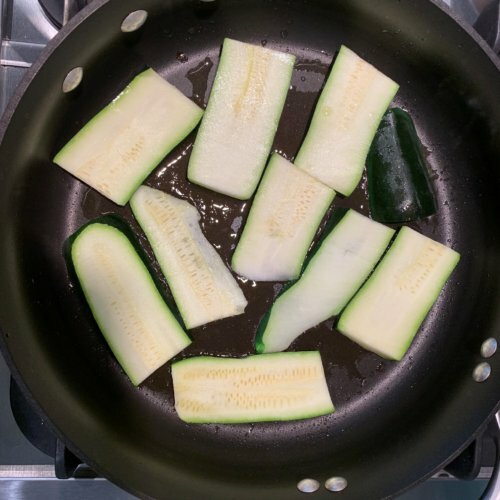 over high heat, heat 1 Tbs evoo and place zucchini in one layer in the saute pan. cook for about 5 minutes flipping halfway through. repeat as necessary. lay zucchini in between two paper towels to dry if necessary. You can also cook these on the grill in a vegetable grill pan! get a large salad bowl and combine mint, parsley, lettuce, and green onions. Lay out all other ingredients and place 1/6 of all the ingredients in a personal sized bowl. top with 1 tbsp (or more if desired) dressing and enjoy!